In this age of technology, with all of the communication we can send via emails and texts, the only things found in the mailbox lately are bills, flyers, and credit card offers. Happy mail is a rare treat! This card might not only elicit a smile, but maybe a giggle too! I used the Fiskars "snip snip" Squeeze punch and a hole punch to create these colorful scissors and a Cuttlebug embossing folder for the background dots. 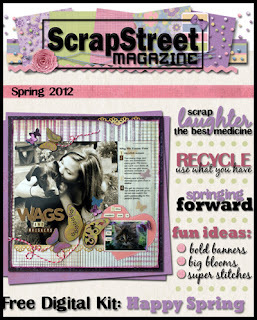 That means it's time for a new issue of Scrapstreet!